Ben Gibson and Patrick Mulligan invested 500 hours of research and illustration in this amazing chart. We newbies to the tree of life should let this sink in: Dinosaurs ruled the earth for eons, millions of years before we came on the scene and began to obsess over them. Ben Gibson and Patrick Mulligan may not have spent that long on their amazing dinosaur chart, but they did put an impressive 500 hours of research and illustration time into the design. A new take on the classification of dinosauria, their plotting of prehistoric fauna helps bring existing classification systems to life. 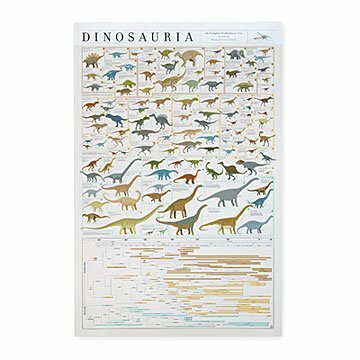 Featuring detailed drawings of over 100 notable speciesfrom tiny Eoraptor to gargantuan Supersaurusthis dino-mite chart even includes an evolutionary timeline to show the awesome progression of the Age of Dinosaurs. For budding young paleontologists and fans old enough to get "didn't you ride a dinosaur?" jokes, it's a fascinating reminder that life... finds a way. Digitally printed using vegetable-based inks on 100 lb. FSC-certified, archival paper. Designed in Brooklyn, New York, where the favorite dino is Kombuchasaurus. Ben Gibson and Patrick Mulligan strive to "connect the dots" by compiling complicated data sets on a given topic of interest and then devising a graphic way to display it beautifully. They met while working at a publishing company, where Ben was a designer and Patrick was an editor. Both collaborated with authors to bring ideas to the printed page, but they had yet to work on anything that was fully their own. Their independent products combine deep research with beautiful design to take the head-spinning data of today's world and transform it into something clean, elegant, and comprehensive. Comes rolled in poster mailer tube. This is a wonderful and informative chart! My son likes to use the proper names for dinosaurs, and this chart will be tremendously helpful in that endeavor. The perfect decor for a dinosaur lover! It's very detailed and beautiful. I was getting it framed and was getting so many compliments! Can't wait to hang it up in my son's room!